In the spring a young man’s fancy lightly turns to thoughts of … asparagus? Or maybe I’m not so young any more if that’s what I’m thinking of. 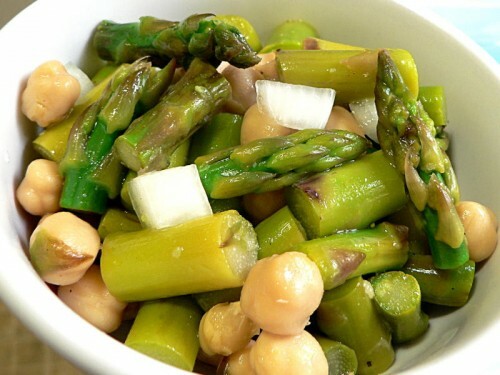 But I am looking forward to doing this asparagus and chick pea salad recipe again with in-season asparagus. Raw asparagus can be stringy and woody. A quick blanching will fix that right up, and improves the flavor quite a bit. Wash and drain the asparagus and cut into one-inch lengths. Prepare a large bowl about half-full with ice-water. Not just cold tap water, actually put a bunch of ice in there. Put the asparagus into rapidly boiling salted water. Within about a minute you’ll see the color go from light to dark green. As soon as most of it has changed it’s time to scoop it all out with a slotted spoon and transfer to the ice-water. While that’s cooling, rinse and drain the chick peas. Drain the asparagus and combine with the chick peas. Dice some onion and add that. How much? Depends on how much you like onion, and how hot it is. Vidalias in season are sweet, but a yellow onion can be pretty hot. Dress with half olive oil and half white wine vinegar and season with salt and pepper. When asparagus is in season you can never have too many great recipes for it. It's just about impossible to do anything good with asparagus that's quicker than this. Wash and drain the asparagus and cut into one-inch lengths. Blanch in salted water until the color goes from light to dark green then transfer to an ice-water bath. While the asparagus cools, rinse and drain the chick peas. Drain the asparagus and combine with the chick peas. Dice and add onion. Dress with half olive oil and half white wine vinegar and season with salt and pepper.